in my late teenage years, i had a summer job in an airport which was great fun at times, but nowhere near as exciting as any films or books that i may have read involving aeroplanes or airports. if there was international subterfuge taking place, i was entirely oblivious to it all. however, one of the advantages, apart from seven-day banking, was the existence of a large newsagent selling not only the regular fare, but publications intended to appeal to the international jetsetter. such as myself, now that you come to mention it. those days involved daily purchase of the times newspaper, a rather illustrious publication prior to purchase by rupert murdoch, after which, it became very hard to read. but the gem amongst the mundane was a small paperback of science fiction stories entitled analog. due to it being an american publication, its arrival on the airport newstand was somewhat erratic, a fact that only added to the thrill of the chase. good science fiction in my opinion, is every bit as valuable as that forming prescribed reading in english literature, though it goes with the territory that the quality varied from chapter to chapter. it was the real spaceship and battlecruiser stories that constituted the pinnacle of the genre as far as i was concerned; the very same pinnacle that had a heavily pregnant mrs washingmachinepost and i many years, later sat in the odeon cinema for a showing of all three original star wars movies. however, in those analog days, aside from having unilaterally agreed on use of the word parsecs and the existence of several levels of light speed, there was the inevitable force-field or shield. this was mostly an invisible envelope of protection surrounding any given space vehicle, one that would always be on standby to repel boarders. quite why these needed to be invisible, i was (and still am) rather unsure, for any invading or defending entity seemed always able to assess whether the shields were up or down. i daresay the latter knowledge saved several million credits on unnecessarily wasting photon torpedoes. bear in mind my initiation into the world of the sci-fi short story was taking place in the late 1970s, each and every author seemed to contend that by the 21st century, invisible force fields would be ten a penny and we'd have great difficulty turning round without banging into one. of course, there were a great deal of sci-fi predictions that have so far failed to come close, let alone true. who, for instance, would have believed we'd still be riding bicycles rather than driving wheel-less vehicles with jet engines, hovering several metres above ground? did nobody ever watch the jetsons? thankfully, the bicycle is every bit as much a part of daily life as many of us would like it to be, a vehicle that has morphed from steel, through aluminium, titanium, carbon and back to steel once more. depending on where one is domiciled, and in view of the continued absence of invisible force-fields, each and every variation still requires some sort of protection, though more from the elements than wayward photon torpedoes. and that, currently, is where redant precision cleaners come into their own. offered in two parts (cleaner and protector), the three variations, distinguished by differing colours of label, provide a total solution for titanium, carbon and matt frames. quite why there are none for steel or aluminium, i'm not quite sure. in the absence of a titanium frame in thewashingmachinepost bike shed, i applied that designated protection to my steel frames. after all, they're both metals and if you don't tell, neither will i. the matt remains unused until an appropriately finished review model arrives at some time in the future. the general idea is to spray the frame all over with the larger can of cleaner, leaving for two or three minutes before washing off with clean water, perhaps putting a bit of elbow grease into those sheep droppings that have concreted themselves onto the underside of the down tube. once done, 'tis but a simple matter of spraying on the protector part of the equation, before rubbing to a rather attractive shine with a dry cloth. (obviously the latter does not apply to the matt product.) 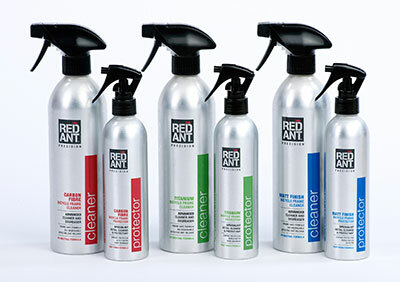 according to redant, the protection lasts for four weeks. the latter i can pretty much attest to with regard to my two steel-framed bicycles. though the titanium product is not specific to a more ferrous metal, it does seem to work rather well, for the finish has remained bright and shiny, with a noticeable reduction in all sorts of guff sticking to their nether regions. i have also prepared my colnago c40 in similar manner, but due to its lack of mudguards, it has not been dragged out of repose to suffer the same slings and arrows of outrageous fortune endured by its steel brethren. it is perhaps an obvious statement to point out that it will take more than a couple of months to test the veracity of redant's claims, though they're currently looking rather prophetic i have to say. in the absence of steel specific protection, i'd happily endorse the titanium for that very purpose, and i'll get back to you on the carbon duo. cost appears to be circa £9.99 per can, and though regular application of soap and water will keep your bike clean, from personal experience, it doesn't prevent bits of your expensive carbon frame from succumbing to sea salt and peat dust corrosion. i'm rather hoping the redant protection will improve on that.